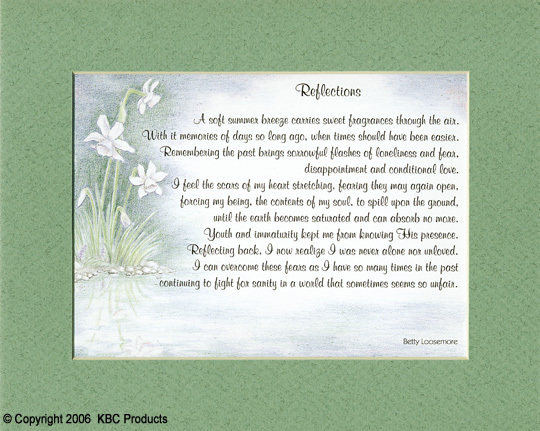 KBC Products - Heartfelt Poetry for Any Occasion. Available in matted and framed. 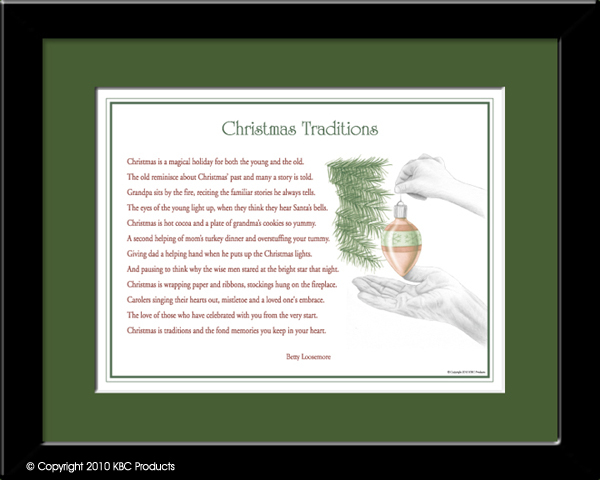 A heartfelt poem that speaks to the family traditions of Christmas we've all experienced. 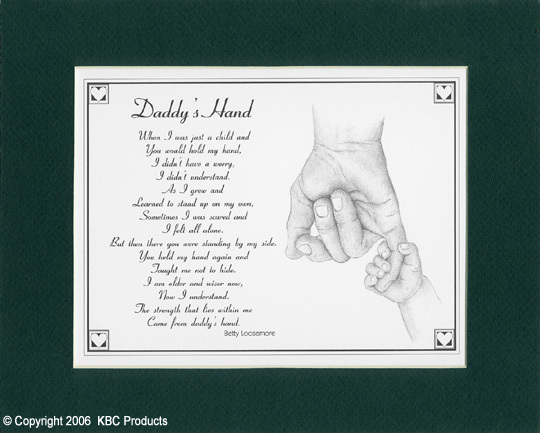 Beautifully matted and framed, this makes a special decoration for the season or a nice gift to family and friends. 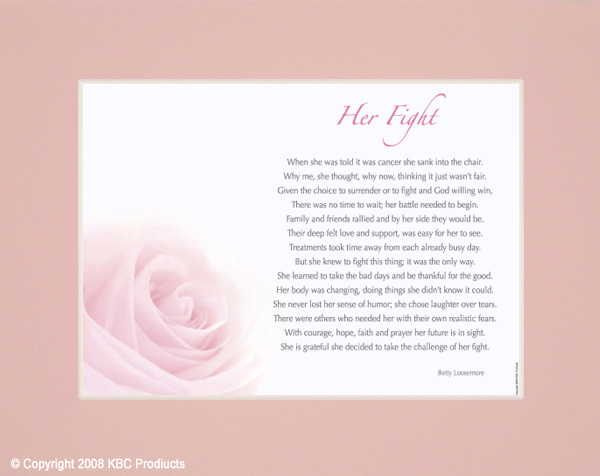 This wonderful poem has been created to honor the fight many women with cancer experience. 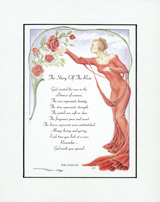 A great support gift to uplift their spirits. 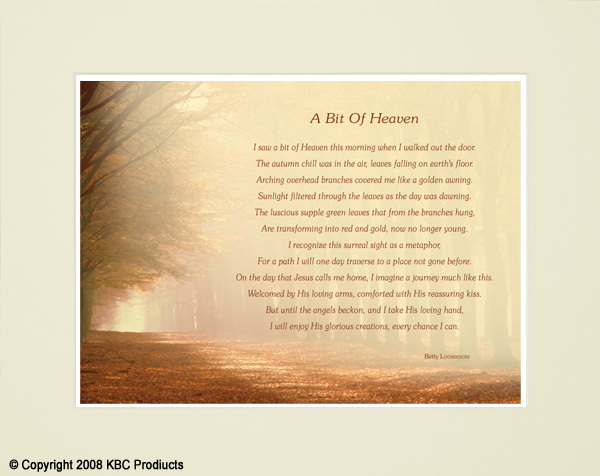 A poem of reflection on life's journey and its many joys. An excellent family blending gift for second marriages. Let the children know that without them, your lives could never be complete. 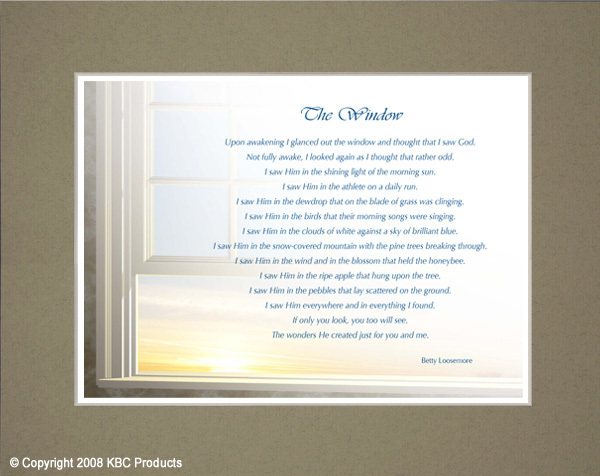 A wonderful poem about the many ways we see God in our everyday lives. 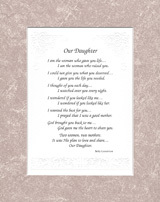 Show Dad how much you care with this thoughtful poem. 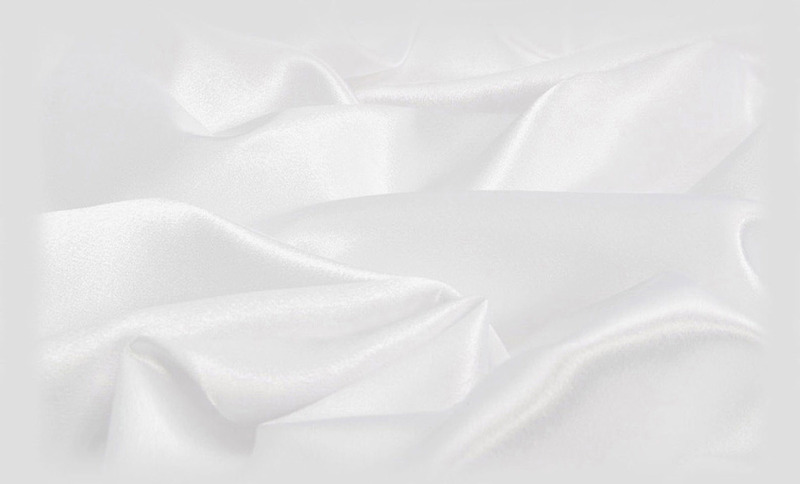 A wedding day is very special for any couple. 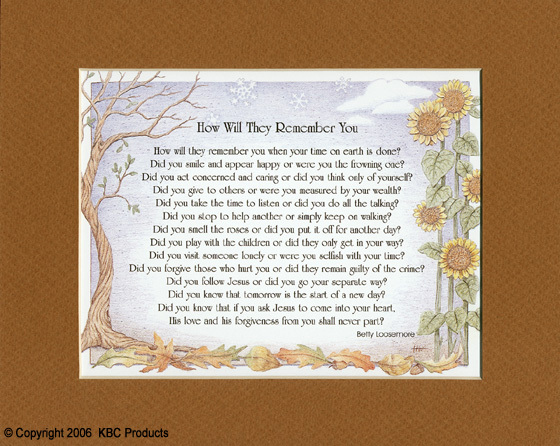 This poem captures that special moment. Great gift for newly weds or for anniversaries. 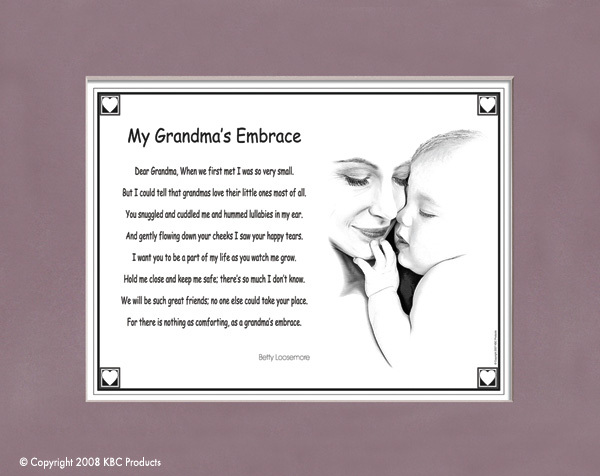 A beautiful poem to show any Grandmother how much you care. 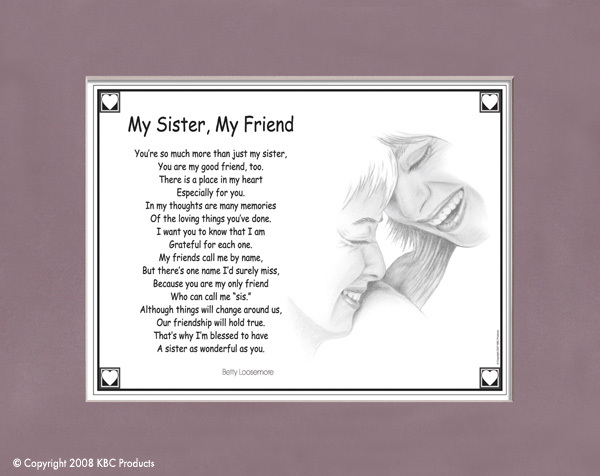 This caring poem reflects the wonderful bond shared by sisters. 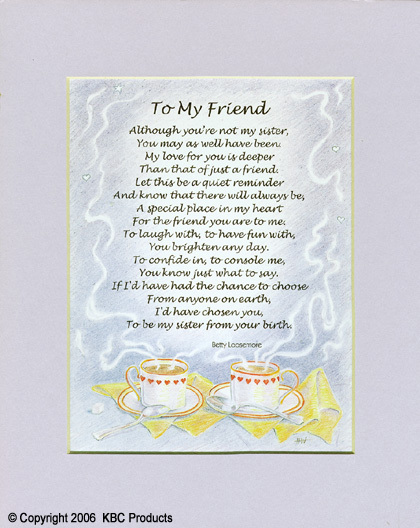 A thoughtful poem that explains the true value of a good friend. A beautiful gift given to the bride from the parent/parents of the groom or given to the groom from the parent/parents of the bride. 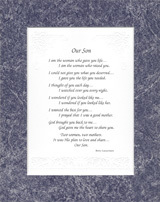 Each expresses the love for their child in beautiful poetry, asking their new daughter-in-law or son-in-law to love their child, too. 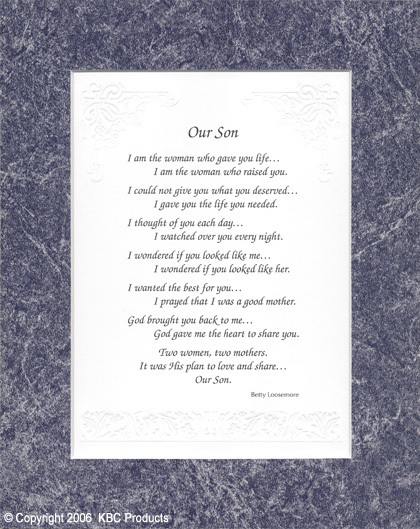 Printed in beautiful script, black ink, on ivy embossed paper, 8" x 10" matted black metal frame with a brushed finish. Has easel back or hangs. 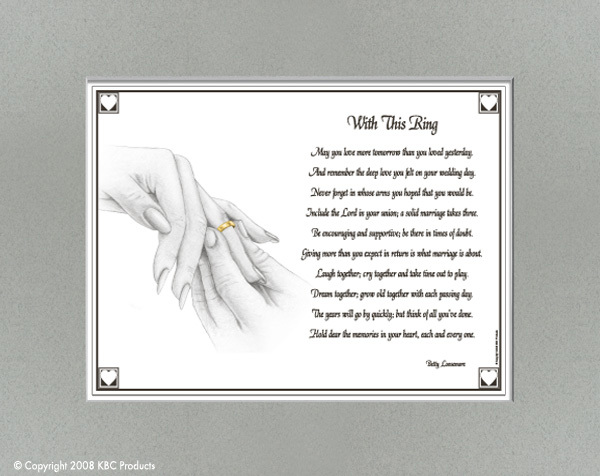 Beautiful poems for 25th, 40th, 50th and No Year wedding anniversaries. Five choices: from a wife to a husband, a husband to a wife, a child to parents, children to parents, a friend or friends to a couple. 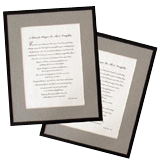 25th framed in silver, 40th black, 50th gold with poem printed on ivory paper and No Year in black or silver metal frames. 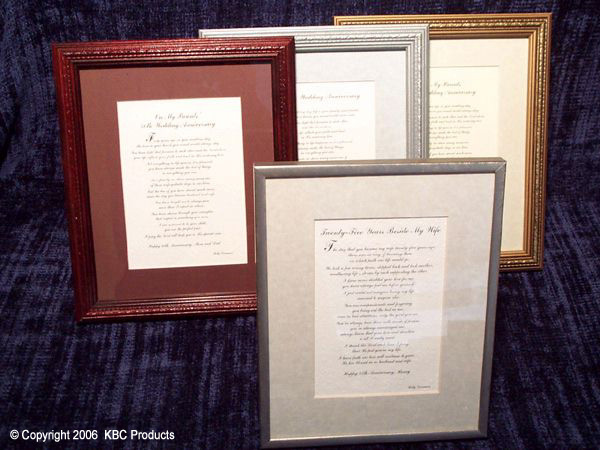 Or 25th in silver, 40th in ruby, 50th in gold and No Year in silver washed with blue wood frames. 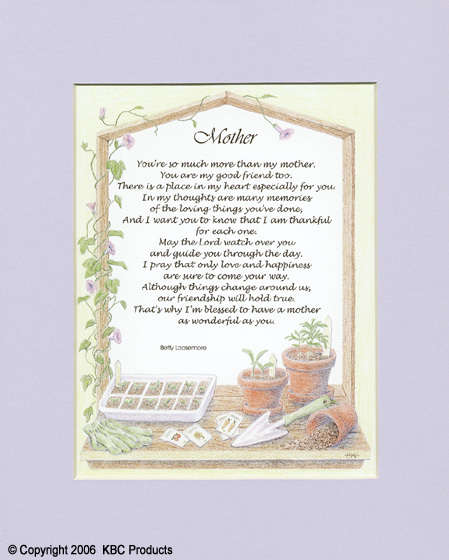 A wonderful poem telling a mother how much she is loved and expresses thanks that she is also a good friend. 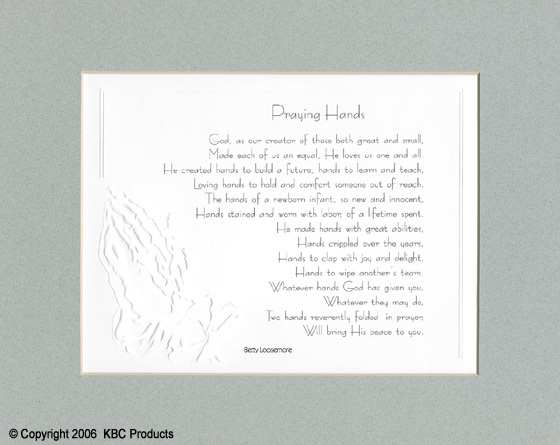 Also available with same verse, on same embossed paper as "A Wedding Prayer". 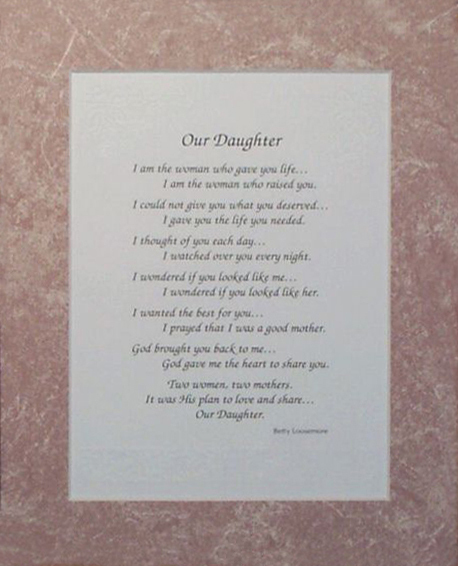 These words bring comfort to someone who has lost a loved one. It tells us to "live each day in awareness, for we know not what tomorrow will bring." Embossed paper. A delightful gift for everyone. "How will they remember you when your time on earth is done?" 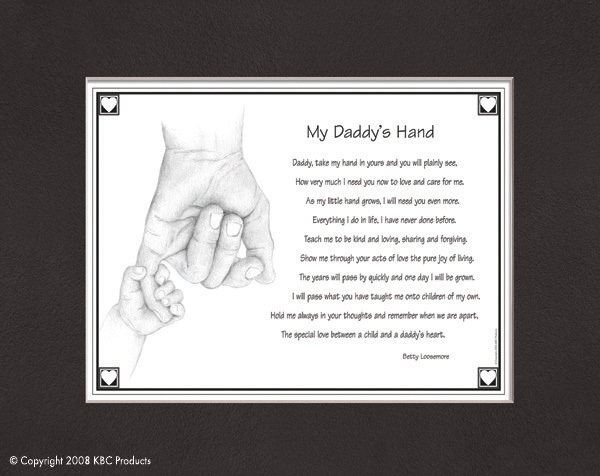 Melt a daddy's heart with this one. 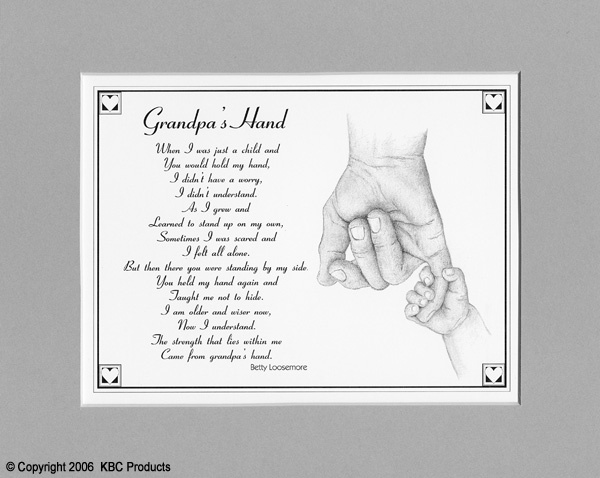 "The strength that lies within me came from daddy's hand." 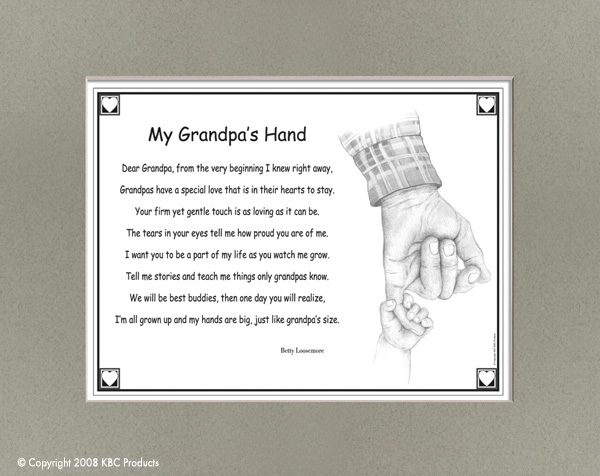 The same poem as Daddy's Hand except for a grandpa. Makes any grandpa proud. A wonderful wedding gift. "Every good marriage is made of three things: A loving man, A loving woman, and God's lasting love." Embossed paper. Silver wood frame. 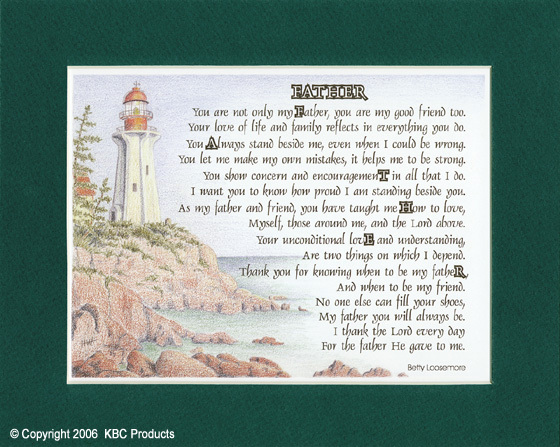 Loving words of thanks to a father for being the guiding light and giving unconditional love and support. 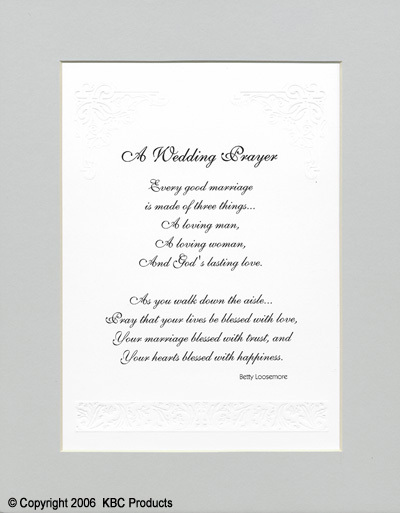 Also available with same verse, on same embossed paper as "A Wedding Prayer". 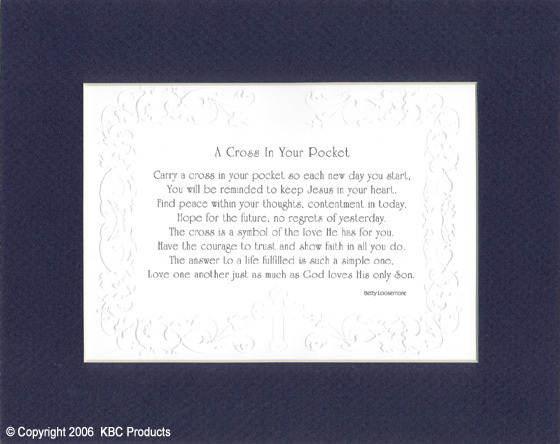 A cross in a pocket is a reminder to keep Jesus in your heart. "The answer to a life fulfilled is such a simple one. Love one another just as much as God loves His only Son." Embossed paper. 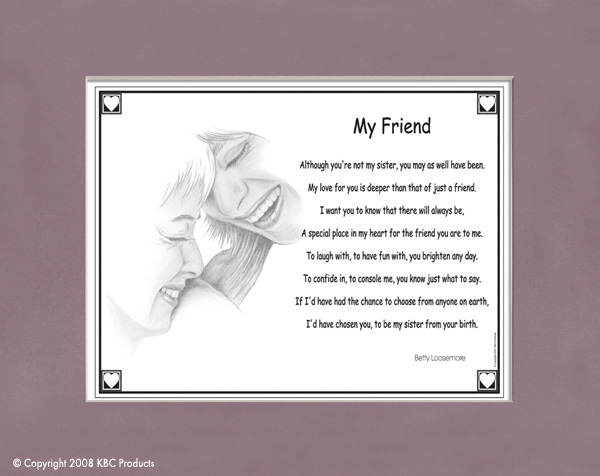 Also available as print and mat only in a clear cellophane envelope. 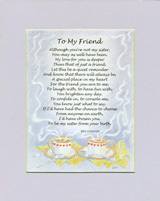 Let a good friend know there is a special place for them in your heart. "If I'd have had the chance to choose from anyone on earth, I'd have chosen you to be my sister from your birth." "Whatever hands God has given you, whatever they may do, two hands reverently folded in prayer, will bring His peace to you." 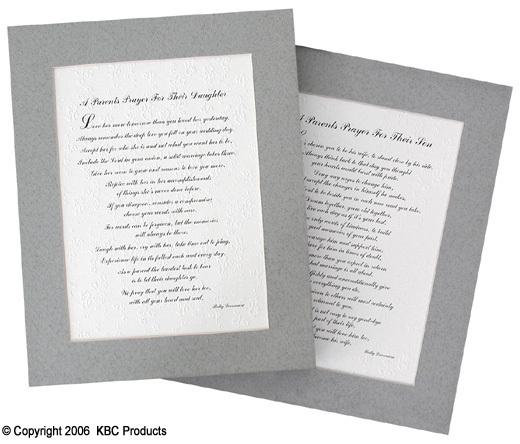 Embossed paper. A comparison of God's creation of woman to the beauty of a rose. "Each time you look at a rose remember... God made you special." A heartfelt poem for an expecting mother. "The love that two share for each other, the reward of being husband and wife, is the creation of a baby, and the joy a child brings to your life." "Is there anything you would change if you could start your life over again?" 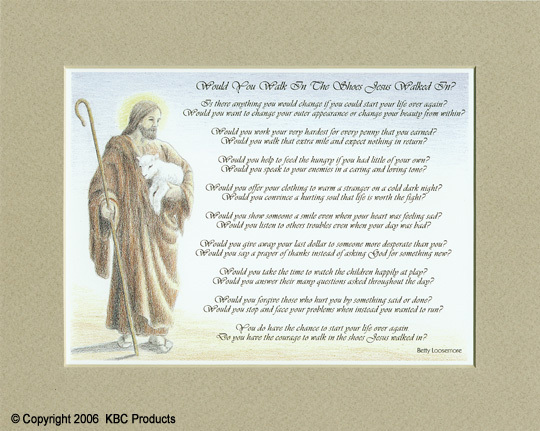 In a series of questions this poem shows several examples of how Jesus lived and how He wants us to live. "Would you offer your clothing to warm a stranger on a cold dark night? Would you convince a hurting soul that life is worth the fight?" "You do have the chance to start your life over again. Do you have the courage to walk in the shoes Jesus walked in?" "What if God were to be in a bad mood today?" Have you ever thought about this? 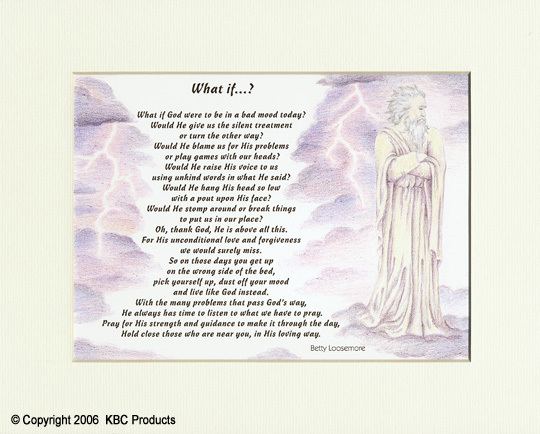 This fun poem shows us what a very loving and forgiving God we have. "So on those days you get up on the wrong side of the bed, pick yourself up, dust off your mood and live like God instead." This poem reaches out to people who are hurting for any reason. It lets them know that God was always there. "Reflecting back, I now realize I was never alone nor unloved." 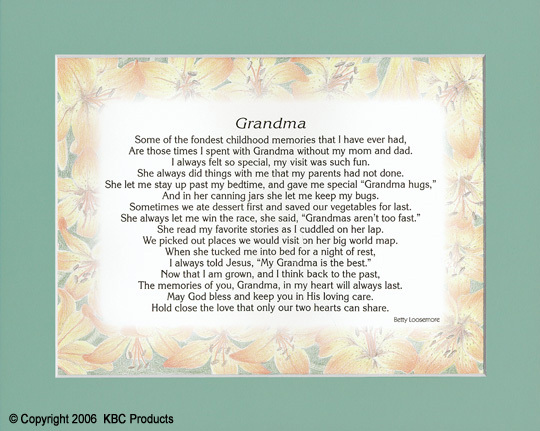 Tell your Grandma how much you love her and cherish the memories of the time you spend together. 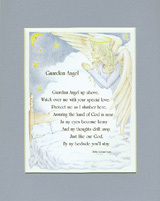 "May God bless and keep you in His loving care. Hold close the love that only our two hearts can share." 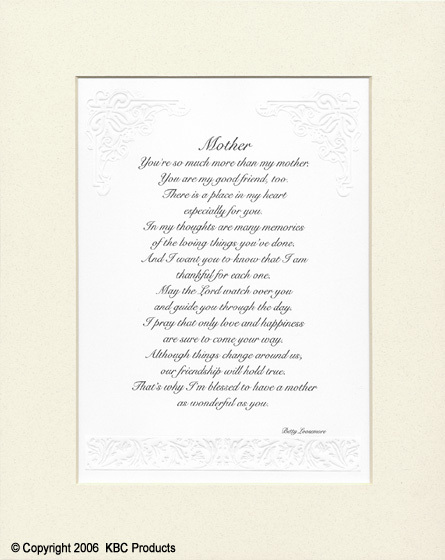 These two poems depict the thoughts of a birth mother and the adoptive mother. 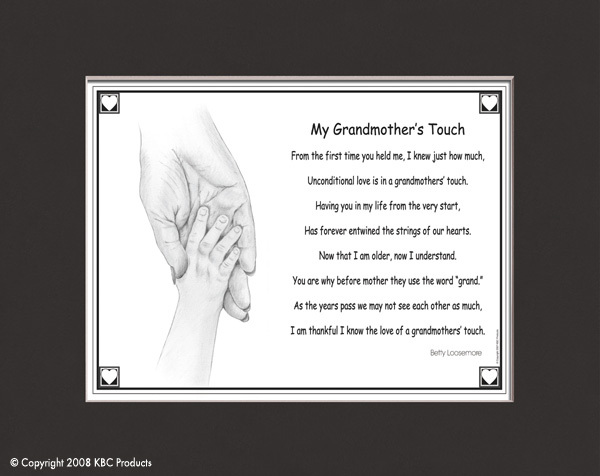 As is often the case, a mother who has given a child up for adoption is reunited with her child in later years. 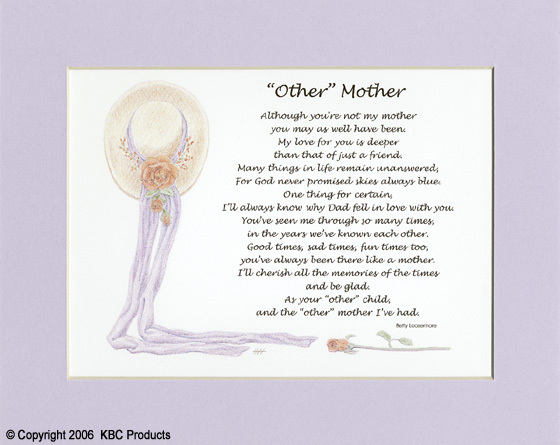 In many of these situations, the birth mother and the adoptive mother meet. What a wonderful gift God has given. Not only has He brought the birth mother's child back into her life, but He has also given the adoptive mother the heart to share her child with the birth mother. "It was His plan to love and share Our Daughter or Our Son." 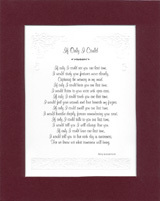 This 8 1/2" x 11" poem is for the precious little one in your life. "One look into your precious little face and we knew, God spent a little more time when he created you". 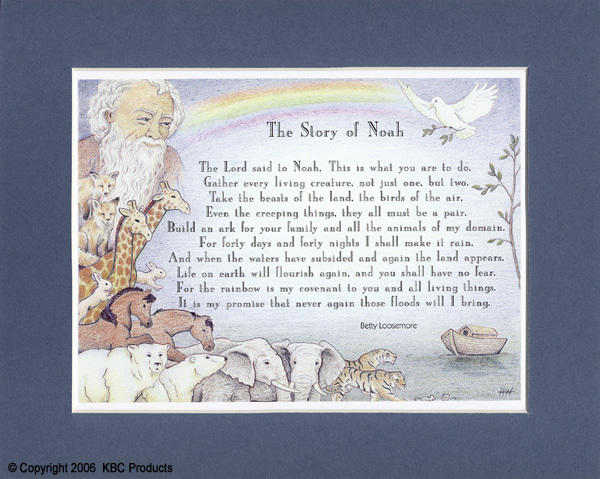 The poem is bordered by a colorful original watercolor of Noah's Ark by Heidi Wastweet of Hayden, Idaho. 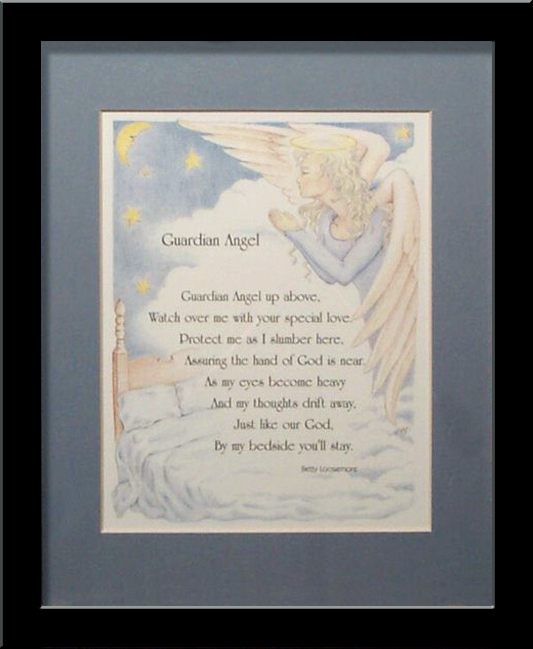 The poem is framed in a clear glass frame that matches any decor. 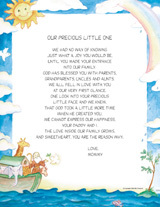 The poem is from Mommy and Daddy or can also be ordered from Grandma and Grandpa, Aunt and Uncle, etc. 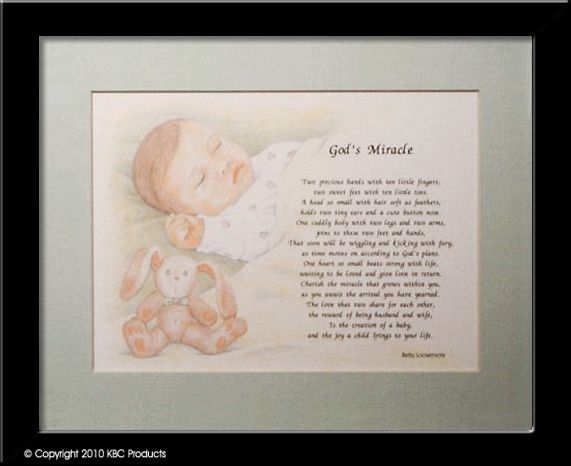 It can also be personalized with a child's name at no additional charge.